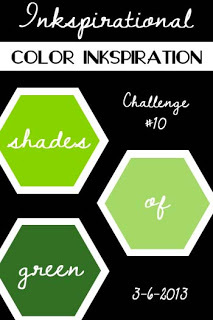 Also entering this into this week's CAS-ual Fridays Challenge (CFC93 - color blocks). I randomly sponged the three shades of green on my watercolor paper and then went over the sponging with the aqua painter to blend. I let it dry and then cut it into three 1" wide strips. I mounted the strips onto a piece of white cardstock, which is popped up on the card front. Easy and fun ... I do love watercoloring no matter which technique I use (there are several). Welcome to my new follower DonnJRP!! So glad to have you with us! Stunning... I started to think about a window with three window screens: I'm looking out to the forest and rays of sunlight spread beautifully through the trees... The water coloring looks so amazing. Wow! Your watercolors are fantastic! I also love the simplicity of the leaf over top. Great job with the color green! So glad that you joined us at Inkspirational! Beautiful background to show off those pretty leaves! Perfectly CAS! Beautiful background! I love the water coloring and the leave die! Perfect!! Gorgeous card Loll! 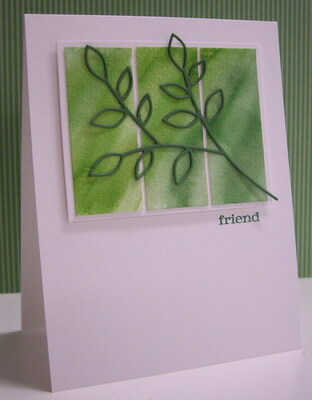 I love the sponged background with the simple leaves on it! Beautiful card Loll, the watercoloured blocks look fantastic. So effective with the leafy diecut on top. This is fabulous Loll, I love the water colouring and the die cut is just a great focal point. I love the CAS look of your card! Thanks for joining us at Inkspirational. It doesn't look blurry on my monitor, Lolly. It looks George S. in every way! Beautiful watercoloring!! This is very artistic, Loll. It reminds me of beautiful wall art. It's simple yet stunning! 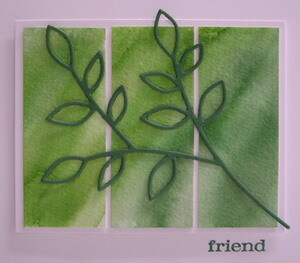 Absolutely gorgeous Loll - love the green watercoloured background and the leaf outline die is perfect over the top! So tranquil and serene yet fresh and springy too - I'm with Colleen on the beautiful wall art! Fabulous card Loll. I love how you used shades of green to create your background panel piece. Thanks for playing along at Inkspirational this week. I really love your watercoloring and the bright leaf against it! Thanks for joining us at the CAS-ual Fridays Challenge! Loll, visiting your blog is one of the first things I do each day. Such beauty there! I CASEd this card, and thought you might like to see my version. I used a slightly different technique for the background. I love the vivid, bright colors you achieved. I'll try again to get a brighter background. Thanks so much for the inspiration!